There is a divine spark within us all. In one man, that spark is about to explode. American businessman Steve Keeley is hurtled three stories to the cold cobblestone street in Zurich. In the days that follow, a doctor performs miraculous surgery on Keeley, who wakes up to find that everything about his world has changed. He seems to sense things before they happen, and thinks he's capable of feats that are clearly impossible. It's a strange and compelling new world for him, one he quickly realizes is also incredibly dangerous. Meanwhile at a $12 billion facility in hardscrabble North Texas, a super collider lies two hundred feet beneath the Earth's surface. 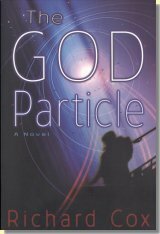 Leading a team of scientists, Mike McNair, a brilliant physicist, works to uncover one of the universe's greatest secrets -- a theoretical particle that binds the universe together, often called The God Particle. When his efforts are undermined by the man who has poured his own vast fortune into the project, McNair begins to suspect that something in his research has gone very, very wrong. Now, these two men are about to come together, battling mysteries of science and of the soul -- and venturing to a realm beyond reason, beyond faith, perhaps even beyond life and death.